In my book and in my post on this blog in August i compared how we teach our children new things, like walking or using the toilet, to how we develop our teams at work. I have since discussed this with a few people and a number have fed back to me that as we are intelligent adults, we shouldn’t need as much help and support. I don’t subscribe to this at all. If you have never done something before, why wouldn’t you need help and training? For example, if you ask someone to write an agency brief and they have never written a brief, is it surprising that they write it badly or get a bad response from the agency? Of course not. Could we do it ourselves quicker and better? Of course. But this doesn’t help anyone in the long term. If we worked through the process, the parts of the brief, let them have a go and then went through it in detail, metaphorically holding their hand and walking them through the process would we get a better result? Of course we would. The challenge is finding the time to do so. However, if this employee was your daughter learning to walk or use the toilet you would find the time and would feel proud when he or she achieved their goal. Having said that, something occurred to me this week. In all the examples and analogies, we generally wait for our children to be ready to learn or show an interest in doing something new. 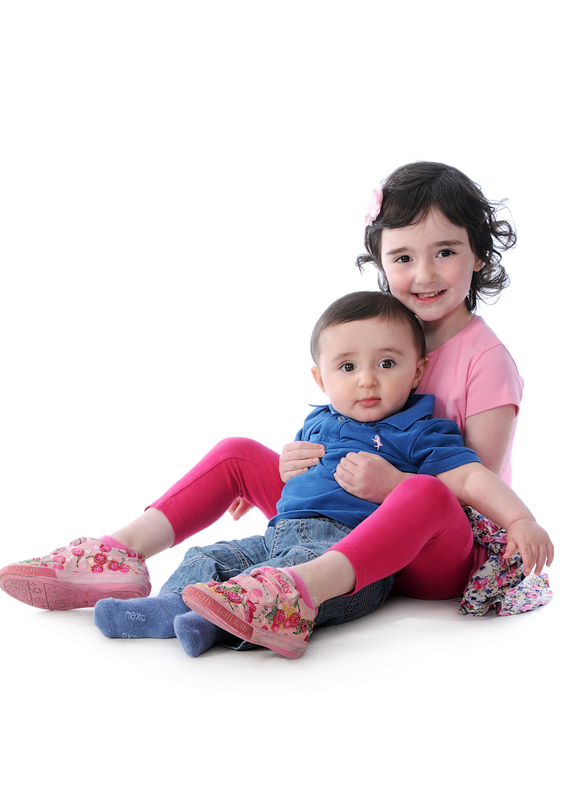 When Jolie and Fraser started to walk, we waited until they naturally stood up and had tried. We then helped and supported them. When we potty trained Jolie we waited until she had shown an interest in learning to use the toilet. When we try to force learning upon our children, it is much more difficult. The challenge is that at work we do not always have the luxury of being able to wait until someone shows an interest in learning or developing new skills. Most of the time we have to ‘force’ new tasks upon them. This means that developing our teams can be extremely tricky. We have to be willing to allow our staff to fall over in order to help them learn and develop. We have to accept that the first few times, they will probably fall flat on their face or have ‘an accident’. However, it is only through making these mistakes and with positive encouragement to persevere that they will conquer the task. We need to build this learning into the timings for a project or start them off on less important projects where we do not mind if there are some problems as we will have the opportunity to fix them before it is too late. We have to encourage them to learn and develop, possibly before they are ready. And with that in mind, we have to make sure we have the right support structure in place to help them deliver. Can you imagine bringing a child home from the hospital and only then considering where they might sleep? Or what they might eat, sit on or wear? Of course not. All of this planning is carried out beforehand to make the transition for both the parents and the child as easy and as positive an experience as possible. The first chapter of my book Making Business Child’s Play is entitled Preparing for a new arrival and looks at why what happens at work for new starters is almost always the exact opposite and what we should do differently. In June 2012, I was offered a new role as the Marketing Director for Martin McColl. Having written my book i had to try and influence my future employer to follow what i advised in chapter 1. I probably drove the HR Director and Facilities Manager a little mad in the process but i believe the result has been a success. I had various conversations prior to joining and managed to ensure that when I started i had a comfortable place to live with furniture I had chosen,. You may think this is a funny choice of words, but we spend a huge amount of time at work and we have to want to be there and feel comfortable where we sit. This is no different to bringing a new child home from the hospital having ensured they will be comfortable in their new home. When i started, my workstation was completely set up and my computer was waiting for me with an email address and log in details. I had a phone with voicemail activated as well as pens, paper and other stationery including a staff telephone directory, organisational charts and employee handbooks. The company had set up an induction programme including time with all key colleagues and in store. I was also given information to read before i started which meant when I arrived, I could hit the ground running. One of the things I made sure was that I was provided with business cards on my first day. I attended a conference a few days into joining and the number of people who were surprised by the fact that i had such a good understanding of the company and actually had business cards was amazing. A few even explained that they had been in their roles for months and still didn’t have business cards. This is actually crazy when all the company needs to know is their name, title and contact details, and they know all this before they set foot in the building! The company also made sure that all administrative forms (pensions, direct debits, life insurance, health insurance, next of kin etc.) were ready to be completed in the first few days. This got all the dull administrative work out of the way early. When a baby is born, normally the mother and father are there to meet and greet their new arrival along with a whole set of friendly and helpful doctors and nurses. In a similar way, on my first day my boss was there to greet me personally. I was shown my office and taken on an office tour and introduced to as many people as possible as well as being shown where the toilets, photocopiers, mail room and coffee machine were. So following my own advice and combining it with the processes already in place has meant that my induction has been a great success and after 6 weeks I am already able to operate with a good working knowledge of the business. The best part is that since joining, my colleagues had been very kind and supportive and I feel in a good place to make an impact in the short, medium and long term. My advice for any company hiring a new starter is to look at this new employee as an opportunity to show off your company. As managers (and as an organisation) you will never get a second chance to make a first impression. As such you have to spend time and effort preparing for a new employee’s arrival to help ensure they are successful in their role. If you don’t, you would look back and think what a waste of time, effort and money and what a shame that you didn’t harnessed the time when that new member of staff is most keen to learn and impress. Being on garden leave during the Olympics has been fantastic! I feel privileged and lucky to have been able to watch hours of live coverage and go to a number of events without having to worry about taking time off work. I was also extremely fortunate that as SPAR is a sponsor of UKA (United Kingdom Athletics), during my years there and through that association i got to meet and spend time with a number of the current Olympic athletes and coaches. What has always amazed me is the commitment, dedication and hard work that all the athletes have, especially the successful ones. It is this dedication to learning and perfecting their craft that makes them so impressive. Obviously they require some level of natural ability but it is their attitude that makes them different. What is striking is the way in which they learning and develop. They train virtually every day. They practice the same techniques again and again to improve. They are coached daily. They are mentally strong. They visualise a positive outcome and more than anything they want to be the best they can be. When i think about this in the context of my children, it occurs to me that when i teach Jolie or Fraser to learn something, it is often through repetition and practice that they learn. For example, when my daughter first looked like she was going to walk, my wife and I were very excited. We did not however, sit her on a chair, explain to her the principle of walking, walk across to the other side of the room and say “Come on, get up, walk” and then get annoyed when she fell flat on her face. This may sound obvious. I hope it does. So what did we do? Support, encourage, help and guide. This meant that before she could walk, in fact before she had even considered walking, we would help her stand up, we would hold her hands and walk her, we would put her in walkers to allow her to walk while supported. When she first pulled herself up on her own, we got very excited and told her how happy we were with her and how clever she was. Then over the next few days as she started to pull herself up on the furniture, stand unsupported, walk a few steps and so on, we continually encouraged her and supported her every move. Finally, after a few weeks, we had a child who walked and soon after a child who walked with confidence. This was absolutely identical to how we approached potty training. We did not explain the principle of using the toilet, remove her nappy, put knickers on her and wish her luck. We explained to her what was happening and why and we actually let her run around with no knickers on and accepted that there might be some accidents. We were not annoyed about this. We did not shout at her because she didn’t know any better. We tried to create a positive and supportive atmosphere within which she could learn. And with help, support and positive reinforcement she was potty trained within 5 days, with only two accidents. 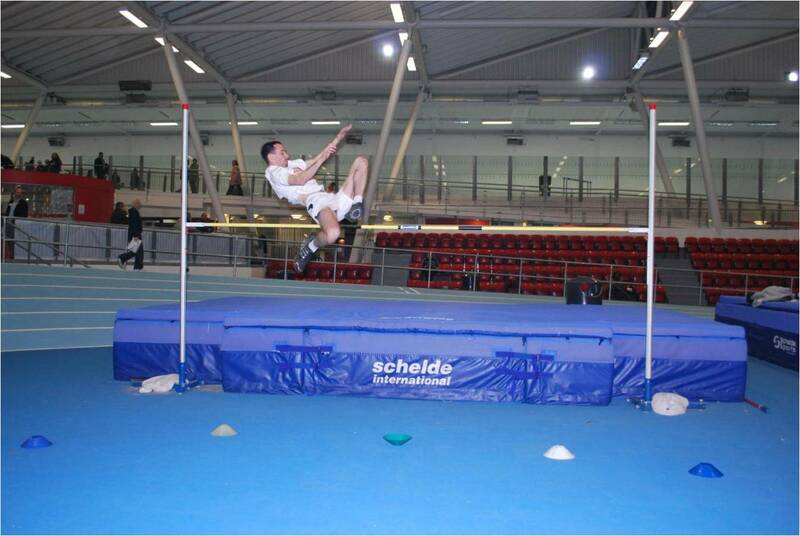 Now whilst i accept that these may be simple examples in comparison to perfecting the High Jump in preparation for an Olympic Games, i do believe that the basics are the same. Being told the principles, being coached, practicing and accepting there will be faults, mistakes and failures. When i think about this in the context of management, it occurs to me that we often forget that the people working for us are striving to achieve. However, I would argue that we don’t treat the people we work with and more specifically the people who work for us with the same level of respect and support. We brief or train people badly, assume they know more than they do and then when they make mistakes, we get annoyed and blame them. We should actually blame ourselves as managers. It’s been an interesting week. I have spent a few months interviewing for a new job which i was offered at the end of last week. I tried to negotiate a little, failed miserably (my kids would probably have succeeded) and happily accepted. I went into work on Tuesday, resigned and told them i was joining a competitor as the new Marketing Director and a few hours later i had packed up my office, left the building and was on 3 months garden leave. On the negative side, I didn’t get to leave and say goodbye in my own way and I feel bad for the team i have left behind as we haven’t had a chance to handover properly. However, there are lots of positives to the situation including the chance to spend lots of time with my kids over the summer holidays. What I find curious is how young children all seem much more accepting of change than adults. For example, when Jolie was two years old we decided to move house. It was not the smoothest of processes. We sold our house in March 2009 with a delayed six-month completion. Unfortunately, when the six-months were up, we still hadn’t managed to buy a new house and we moved into my sister’s flat for three months before finally moving into our new home. Then after another three months we moved out into my parents’ house for seven weeks whilst we had some building work carried out. For my wife and I, this process was hugely unsettling and repeatedly we had to find a new routine to make things feel normal. For Jolie, however, it was all fairly easy. She adapted to each situation easily and dealt with the ambiguity and change with very little effort and no anxiety or fear.change differently. Every time I have moved jobs, I have been afraid. Would the grass be greener somewhere else or was it better the devil I know? I think on this occasion i haven’t waited too long to move and the time is right to seek out new opportunities. There was a tipping point in February where I realised that I wasn’t going to get what I needed from my current job and I would either have to change my goals or move roles to achieve them. This coincided with a lucky break from an old work colleague who wrote to me to see if i might be interested in a new job. I was not unhappy and desperate to leave and this enabled me to take my time and choose my next position carefully. I am really excited about my next role and this process has taught me that sometimes I have to be brave and accept the need to change to move forwards. I have seen fear defined as Fake Evidence Appearing Real and learnt first hand that avoiding fears can actually make them scarier. If you face whatever you are afraid of, the fear will start to fade and become easier to cope with until eventually it is no longer a problem and you are not afraid anymore. Eleanor Roosevelt once said “You gain strength, courage and confidence by every experience in which you really stop to look fear in the face. You must do the thing you think you cannot do”. I would encourage anyone reading this to consider that an admission of fear is not a time to show cowardice but an opportunity to show courage. So i have just returned from a five day trip to Center Parcs. This was our third consecutive yearly visit and once again we had a fantastic time but came back more tired than when i left. I don’t think there are any relaxing holidays with young children and we all had fun, so that’s all that really mattered! One of the things that i have written about in my book but that echoed true once again was the desire we have to ensure our children continue to experience new things. During this trip we took Fraser to messy play, went swimming and left him for the first time ever for 3 hours in a kids club. Jolie went pottery painting, swimming, to kids clubs and tried tennis and archery for the first time. I believe one of our roles as parents is to keep trying to introduce new experiences. This is also true of our role as managers. The way in which we help our children learn is also important. 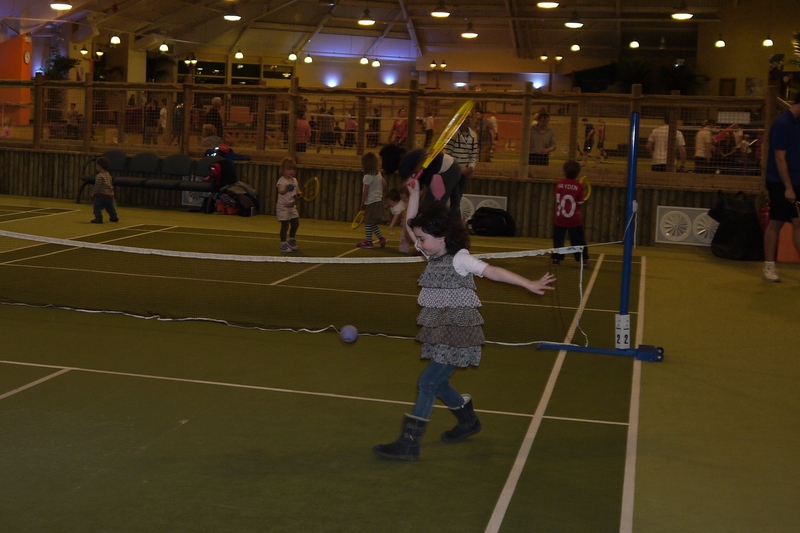 For example, when we went to tots tennis, we did not sit her down on the court and explain to her the principle of playing tennis, walk across to the other side of the court and say “Come on, get up, your serve” and then get annoyed when she had no idea what to do! So what did we do? Support, encourage, help and guide. In our 30 minute session, we worked on ball skills (i.e. throwing and catching), racket skills (i.e. forehand, backhand and smash) and a short game. At the end of the session, she had been introduced to tennis. If we persevered she would improve and learn to play. It would take time and commitment. I do not think that we generally treat the people we work with and more specifically the people who work for us with the same level of respect and support. We brief or train people badly, assume they know more than they do and then when they make mistakes, we get annoyed and blame them. We should actually blame ourselves as managers. For example, if you ask someone to write an agency brief and they have never written a brief, is it surprising that they write it badly or get a bad response from the agency? Of course not. Could we do it ourselves quicker and better? Of course. But this doesn’t help anyone in the long term. If we worked through the process, the parts of the brief, let them have a go and then went through it in detail, metaphorically holding their hand and walking them through the process would we get a better result? Of course we would. The challenge is finding the time to do so. However, if this employee was your daughter learning something new you would find the time and would feel proud when he or she achieved their goal. The reality is that most of us don’t spend the right amount of time with our team, we don’t give them the support they require and they do not come first. We fail to realise that if they did, our lives would actually be easier in the long term. We see them as a necessary burden and we behave as such. The harsh truth is that it is only by giving our teams and children time and support that they can learn and develop. My first ever review… And it was positive! Phew,,. Making Business Child’s Play will help you gain an edge in the workplace using essential management skills that are second nature to parents and children. It demonstrates the importance of mastering the skills and techniques we possessed as children and exhibit as parents. By identifying the parallels between what goes on at home and at work, it demonstrate how we can transfer behaviours to be more successful within a business environment. So what is my book all about? I read a quote that said “While we try to teach our children all about life, our children teach us what life is all about”. My children were the inspiration for my book, Making Business Child’s Play and through parenting and watching them develop and grow I have learned so much. So in a nutshell… this is what it is all about…. Can you imagine bringing a child home from the hospital and only then considering where they might sleep? Or what they might eat, sit on or wear? Of course not. All of this planning is carried out beforehand to make the transition for both the parents and the child as easy and as positive an experience as possible. Chapter one looks at why what happens at work for new starters is almost always the exact opposite and what we should do differently. Once we have children, we have no choice but to change our daily routines. Everything we had to do before, from paperwork to tidying the house still has to happen and we instinctively adapt to find the time. We prioritise, schedule, manage distractions and interruptions, organise, multi-task and avoid procrastinating. Chapter two suggests ways in which we can use these behaviours in a variety of other situations, including at work, where we struggle to manage our time as effectively. Children have a passion to learn and we behave in a supportive, encouraging and helpful way to ensure they develop and grow. We sometimes forget that the people working for us are striving to achieve and if we had the same attitude as with our children, and gave them the time and support they need to develop it would pay dividends in the long term. Chapter three looks at ways we can ensure both ourselves and our teams at work can continue to learn and thrive. Curiosity can jump start the creative process and is critical to almost any decision making, planning or brainstorming activity. But how many of us have stopped asking why? How many of us are asked to do something by people we work with, or our bosses, and just write down the request, walk away and try to get on with it? Chapter four encourages us to behave like children and continue to ask why, even when it is difficult. The ability to focus totally on one thing comes naturally to us all when we are young but becomes more challenging as we get older. We have more distractions, we struggle to focus and concentrate and as a result, we fail to get on with the work we are meant to be doing. Chapter five looks at techniques to help us improve our attention as well as ways to grab and hold other people’s attention. There are undoubtedly negotiation skills that come naturally to a child that we as adults have lost. Even those of us who have been on negotiation training courses can struggle to replicate these skills as effectively. Chapter six looks at how children use enthusiasm, what if questions, creativity, high initial demands, patience and even throwing tantrums as effective negotiation techniques that we could all utilise. As well as being very good negotiators, children are have a knack for influencing and persuading. They find common ground, forgive and forget, are positive and enthusiastic and naturally use non-verbal communication. Whilst these are skills we can all use, as parents we constantly influence our children through making them part of the decision making process, using headlines and telling stories. Chapter seven looks at how we can transfer these behaviours to the workplace. Young children seem to have very little fear and are much more accepting of change than adults. Yet as they get older they become more afraid, perhaps because as parents we try to use fear to control our children. Chapter eight looks at the natural ways in which parents behave to help our children cope with their fears and how we ourselves could exhibit them more at work. With our children, we have an extremely strong and deep bond, but this is rarely replicated at work. One of the reasons for this is that we understand what they want and need (most of the time) because we actually listen and really hear what they say. Chapter nine looks at how much better things could be at work if we listened to and cared about our colleagues. Chapter 10: Who is really in charge? As an adult, I like to believe that I am the one in control of my destiny, my wife, my children, my staff, my life! But I think much of the time I am not actually in charge of anything. At work I am told what to do by my boss and upwardly managed by my team. At home I am told what to do by my wife and my children. Chapter ten looks at the similarities between techniques to discipline and control at home and at work and how these can be utilised to make us more effective in both environments. 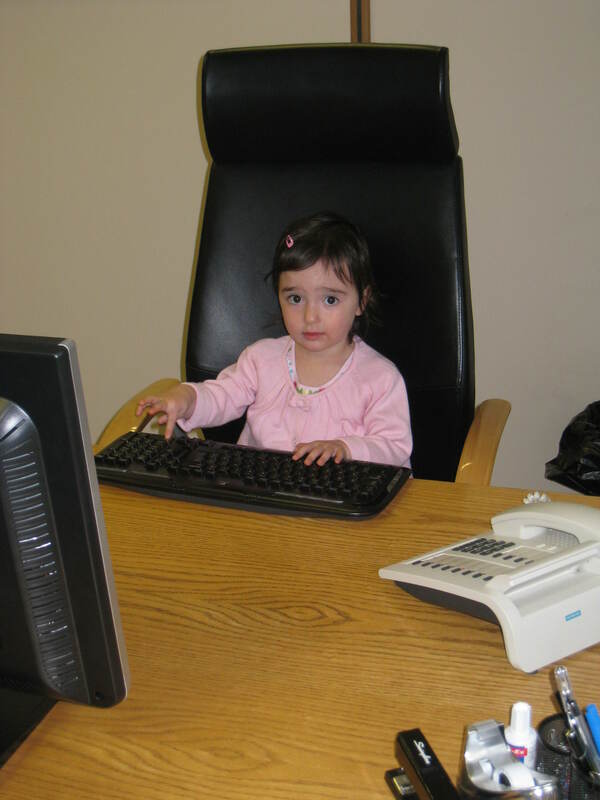 Business is child’s play… i am not alone! So here I sit feeling fairly proud that I have finally finished my book, have started a blog, have constructed a Facebook page, am using Twitter, have built a website (or my cousin has!) and have now managed to get the book and ebook into worldwide electronic distribution. Admittedly i am yet to sell a copy… but all in good time! I was also feeling fairly smug that no-one else had any ideas similar to my own. I have searched around and on the topic of ‘Making Business Child’s Play‘ for over 18 months and only this week did i discover another blog ‘Business is Child’s Play’. My heart went into my mouth, my stomach turned and i had a horrible feeling that my unique idea wasn’t that unique after all! The blog dates back to October 2010. Bizarrely, this is the same exact point that i started writing my book. It is written by a lady called Marilyn Cox who is a mother to 2 small children, wife and manager of a marketing operations team. I am a father to 2 small children, husband and head of marketing. The similarities are a little spooky. Her blog relates experiences with children to the development of problem solving, communication, and finding humor in all aspects of life. She learned that lessons can be gained from her home life as well as work experience and decided to share them via her blog. I came to similar conclusions and decided to write them in a book. So I browsed the site and after a while i came to realise that there were a huge amount of complimentary similarities between my book and Marilyn’s blog. However, there are also a number of key differences. If anyone finds the topic intriguing… i would recommend both my book and Marilyn’s blog (http://businessischildsplay.com/). Having never met or spoken to her… i hope she doesn’t mind me doing so! Are tantrums a negotiation technique? Someone once told me that “life is a series of negotiations”. Since I have married and had children, this has become more and more apparent! 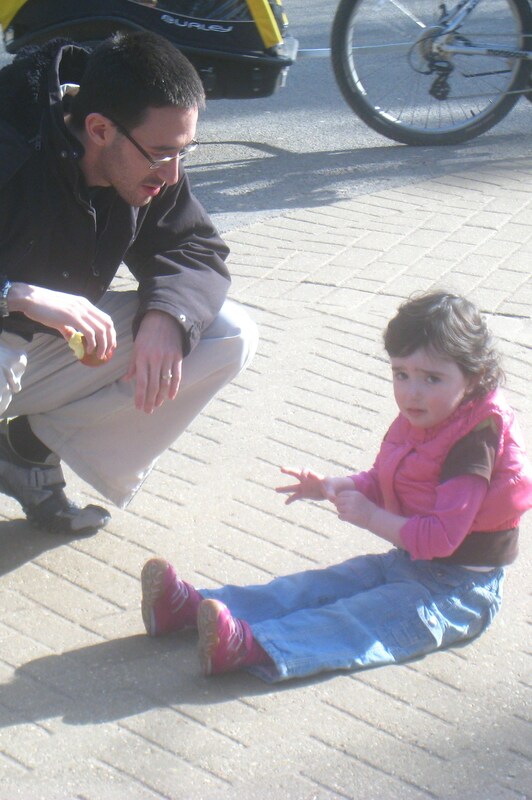 My daughter has thrown some phenomenal tantrums in her 4 years so far. In fact, even today we had screaming, shouting and storming off because i wouldn’t let her take her dress off to run around in the garden in just a vest. It was too cold! But surely this is a negative behaviour that shouldn’t be replicated in the workplace? This was my first reaction but in reality, whilst people in the workplace do not generally lie on the floor kicking and screaming and having tantrums like children, many people do have tantrums in their own way. Alex Ferguson, the Manchester United manager, has similar fiery traits to his reputation and is known to have thrown cups of tea and water bottles at his players. One of the girls who works with me goes silent and moody when she is‘having a tantrum’ at work. In reality, our reaction to both the thought of these tantrums and the reality is to try to avoid them. However, with people we work for or those that work for us, they can’t be avoided and as a result we often give in, especially if the things we are giving away are rationalised as ‘little things’. In fact, we often give in before the negotiation has even happened. For example, when we know that if we do X, our boss will ‘throw a tantrum’, we inevitably try and avoid doing X in the first place. The trick could be to throw a couple of tantrums to demonstrate where the lines are drawn and then you will probably never need to throw one again! However, as managers we need to respond to this behaviour and develop our staff to prevent them throwing tantrums on a regular basis. After over 18 months of writing, editing, designing and trying to get to grips with the world of publishing and self publishing my book is finally complete and soon to be in worldwide distribution. 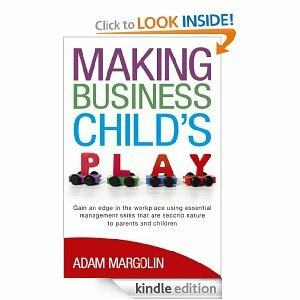 Making Business Child’s Play demonstrates the importance of mastering the skills and techniques we possessed as children and exhibit as parents. By identifying the parallels between what goes on at home and at work, it demonstrates how we can transfer behaviours to be more successful within a business environment. 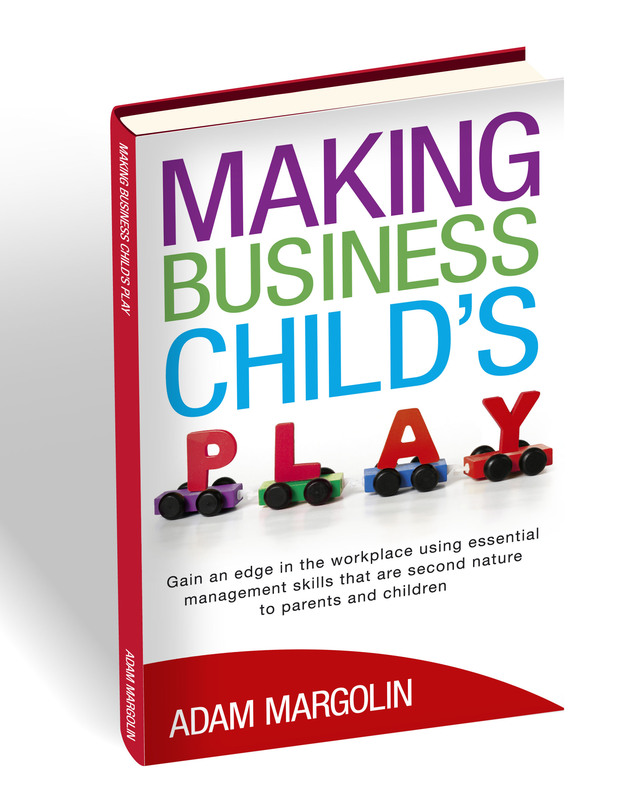 Making Business Child’s Play is for people looking for practical, action oriented ideas about business behaviours in an accessible entertaining style. It is written to be read in less than two hours, ideal for your next train journey or flight. It is not written as a textbook but provides lots of insights, hints and tips across a wide variety of topics through a very personal series of stories and analogies about myself and my two young children. The book is for all types of people across all types of industries but is perfect for aspiring managers with young children working in an office environment. So, if you are interested in a book which takes a fresh innovative look at common subjects then this book is for you. Once you have finished reading, you will have discovered an array of practical tips and techniques giving you a changed and enriched perspective as a manager and/or a parent. Whilst I may never sell a copy of my book, i’m proud of what i have achieved so far. This blog aims to become the living breathing version of the book with up to date real life home and work experiences.